Kevin Bacon once claimed he had worked with everyone in Hollywood. As a result, the ‘Six Degrees of Kevin Bacon’ game evolved where movie lovers challenge each other to find the shortest path between an arbitrary actor and veteran Hollywood star Kevin Bacon. Now the Hollywood star has linked himself to the Irish pop sensation Jedward. 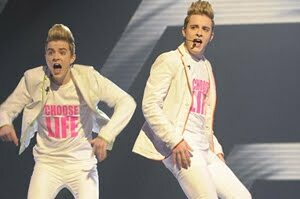 The Irish twins achieved fame after being featured on the UK edition of the X Factor in 2009.